I was working on a made for TV movie called “On Thin Ice, The Tai Babalonia Story” in Toronto. It was a very demanding shoot, and maybe in a future post I’ll talk about why. On second thought, no time like the present. 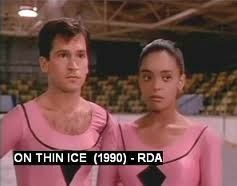 It was a figure skating movie about Tai Babalonia and Randy Gardner, who had been skating partners since childhood. Figure skating was their whole life. They made it to the Olympics, and then had to drop out because Randy suffered a groin injury and couldn’t compete. Tai took it hard. She wasn’t happy with the next phase of her career – skating in the Ice Capades. She spiraled into diet pills and alcohol until she crashed and burned, ultimately attempting suicide before ending up on my set as an advisor and standin skater, thanks to a Peoples Magazine article that brought her renewed attention. Whew. There were many things that made that shoot difficult. First of all was the script. Many scripts begin with the main characters as children, then time lapse to them as adults. That’s standard. This script began with the children and followed them in a smooth unbroken curve through adolescence, into teen years, and into adulthood. This meant that we needed three actors to play each character, or six actors for the movie’s main characters. They had to be believably the same people at different ages. To top it off, we needed a skating double for each of the main actors, none of whom could skate well enough to pretend to be Olympic material. So that meant we had to find twelve people to play the two main characters. And to really add to the tension, the powers that be at the network, were withholding casting approval. So we were two days before the shoot was to start and we didn’t have approval for our key actors, who would trigger the choices for the other ten key actors in the show. Then there was the nature of the shoot, and the executives back in Hollywood who had, it seemed, no idea of how film is edited. The standin skaters, the real skaters, couldn’t start from a dead stop. They would need at least a few steps toward the camera to get up to speed. Then, on a turn,we could cut from our actors to our stunt doubles. But the folks back in the screening room had seen the identity of the stunt doubles. They couldn’t believe that the audience would accept them as the actors. So they kept demanding wider and wider shots, as if that would solve the problem. They also kept demanding closer and closer closeups of the main actors. It felt like we were making an increasingly claustrophobic film about a wide open ice rink. That was at a high point in my own career, and a high point in my arrogance. I had no conception of playing politics, or being aware of who gave me directing opportunities. Case in point, the day before the first day of shooting, the (very experienced and competent) line producer, Janet Faust, (from whom I learned a lot) told me that she would ride to set with me in the morning. I said no. I told her my ride to set was a time for me to get my head into the day’s work. The only person who could ride with me was my AD. At the time this seemed like a perfectly reasonable position to take. But from my perspective today it was incredibly stupid. The AD was never going to give me a job. A relationship with the AD might be good for my ego and my work, but it was pointless compared to a relationship with a real network producer. But there you go. That was me back then. I hope Janet can forgive me. She has been incredibly gracious, even though she has told me to my face that I’m a jerk. I tend to agree. So, what was this epiphany of which I spoke? Well… I couldn’t understand why the producers were happy with the dailies when I was not at all impressed, but when I was happy, the producers were looking really worried. It finally dawned on me that we were trying to make two different things. They were trying to make television. I was trying to make something better than television, something original and unique and powerful. So, when they were happy I was like, yeah, okay. It’s television. But when I was happy they were like, uh, wow. I mean, it’s really something. But is it what we want? It doesn’t look like television. Of course, like many epiphanies, this may be complete conjecture on my part. We really didn’t find time to talk about it. I could be just projecting. No doubt the producers were trying to make something that transcended television too, as proven by the dreamy skating scene Janet suggested as a cap to the movie. What I am one hundred percent sure about though is that the producer thought I was a jerk. With good reason. I was giving the movie everything I had, but my emotional intelligence was, in retrospect, embarrassing. Apologies to anybody I hurt. Mea culpa. Mea maxima culpa.